Slice heights are required for the FDM printer to print each part of your 3D model layer by layer. Dependent on the material type loaded in the spool, and the printer itself a range of different slice heights are available. The slicing operation is conducted within the prep software prior to printing. Choosing a higher resolution with a higher and thinner slice number will increase the surface quality of the part, but also increase time taken to print. It is important to note that really high resolutions are often indifferent in appearance to resolutions slightly lower, therefore you can achieve a near identical resolution with a much shorter print time. Problems can be caused by poor CAD/ design practices; the result is a weaker part. To prevent this prep software such as Insight or GrabCAD should be used to generate toolpaths of the model. The toolpath is essentially the path the extruding head will take during the print process and where it will apply material. By anallysisng the sliced model layer by layer, the designer can spot areas of weakness in the toolpath, and improve these by infilling or adapting them. 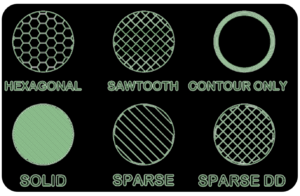 Customised toolpaths are also something to consider. Dependent on the application, you can generate and optimise toolpaths with prep software to make certain parts stronger or lighter.